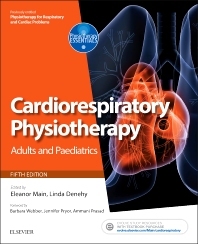 The fifth edition of this seminal textbook continues to provide those who are studying or are in practice with comprehensive evidence-based coverage of all the main aspects of respiratory and cardiac physiotherapy throughout the whole lifespan – neonates, infants, children, adolescents and adults – with the patient at centre and advocating a problem-based approach. For the new edition, Jennifer Pryor and Ammani Prasad hand the baton of editorship and their lasting legacy over to Eleanor Main and Linda Denehy. With a team of over 60 international expert authors, the new editors have incorporated major changes reflecting current cardiorespiratory physiotherapy education and practice. These changes are heralded by a new title – Cardiorespiratory Physiotherapy: Adults and Paediatrics (formerly Physiotherapy for Respiratory and Cardiac Problems: Adults and Paediatrics) – and a significant restructure of the content with a new set of chapters. A new key chapter on anatomy and physiology of the respiratory system lays the foundation which is then followed by a chapter on clinical assessment of adults, infants and children, and acutely ill or deteriorating patients. Additional new content includes a chapter on outcome measurement in practice and a large chapter describing rehabilitation in acute and chronic conditions in special populations including spinal cord injury, oncology, trauma and paediatrics. The chapter on therapeutic interventions is comprehensive and reflective of evidence based practice. Bank of 350 images on Evolve Resources. Log on to https://evolve.elsevier.com/Main/cardiorespiratory and register to access. Eleanor Main has been involved with clinical physiotherapy, teaching and research at Great Ormond Street Hospital for Children and the Institute of Child Health in University College London for almost 24 years. She qualified as a physiotherapist at the University of the Witwatersrand, South Africa (1988) and worked as a paediatric physiotherapist at both the Red Cross Children’s Hospital in Cape Town and then Great Ormond Street Hospital. She completed a BA (English and Psychology) at UNISA in South Africa (1991), an MSc in research methods from King’s College, London (1995) and a PhD in paediatric respiratory physiology from University College London (2001). She was appointed as Lecturer in Children's Physiotherapy Research at UCL in 2001, promoted to Senior Lecturer in 2007 and to Professor of Physiotherapy in 2015. She has been programme director for the UCL postgraduate Certificate, Diploma and MSc in Physiotherapy at UCL since 2005, and has supervised five PhD students and 79 MSc project dissertations to date. In 2011 she was awarded a Fellowship of the Chartered Society of Physiotherapy in London for her ‘significant contribution to education, teaching and learning in the field of cardiorespiratory and paediatric physiotherapy’. Eleanor’s primary research interests relate to outcome measurement and clinical efficacy studies in physiotherapy. This research, resulting in more than 80 peer-reviewed publications, and attracting over £2 million in project grant funding so far, has resulted in substantive advances in the understanding of assessment and treatment of children who require physiotherapy. Linda Denehy is a PhD-qualified physiotherapist who is Head of the Department of Physiotherapy at the University of Melbourne, Australia. Linda graduated in physiotherapy in Melbourne and spent 20 years as a clinician managing respiratory medicine, thoracic surgery and ICU patients both in Melbourne and at the Brompton Hospital in London. She has been a teaching and research academic for nearly 20 years and obtained her PhD in 2002 in the management of patients having upper abdominal surgery. Linda developed curricula in cardiorespiratory physiotherapy both for undergraduate and postgraduate students and lead the implementation of the new three-year Doctor of Physiotherapy entry to practice course at the University of Melbourne. She has supervised 30 research higher degree students to completion and has extensive research expertise in the area of cardiorespiratory physiotherapy, particularly in patient populations who are acutely unwell, including patients following major surgery and critically ill patients. She has over 100 research publications in peer-reviewed journals, 15 invited editorials or book chapters and has been invited to more than 25 national and international meetings as a keynote speaker. These include the European Respiratory Society 2014 and the American Thoracic Society 2014 and 2016. She is currently involved in developing international guidelines for ICU mobility and outcome measures in ICU. Linda has been successful in obtaining funding from over 30 applications of over AUD $6million for research into physiotherapy and rehabilitation, including as a chief investigator on five nationally competitive grants in rehabilitation after critical illness, lung cancer and breathlessness in COPD. She reviews for national and international competitive granting bodies and for several international scientific journals including, Lung Cancer, Intensive Care Medicine, Critical Care Medicine and Thorax. Her research has contributed to evidence-led practice, clinical guidelines and improved patient-centred outcomes.